Did Michelle Obama Trigger Wave Of Eating Disorders? can we all say, UNGAWA! I just burst into laughter! Between this and the “Silverback” comment I must admit I love your humor & quick wit. I thought I hated Michelle; but, you have me beat. CHEERS! 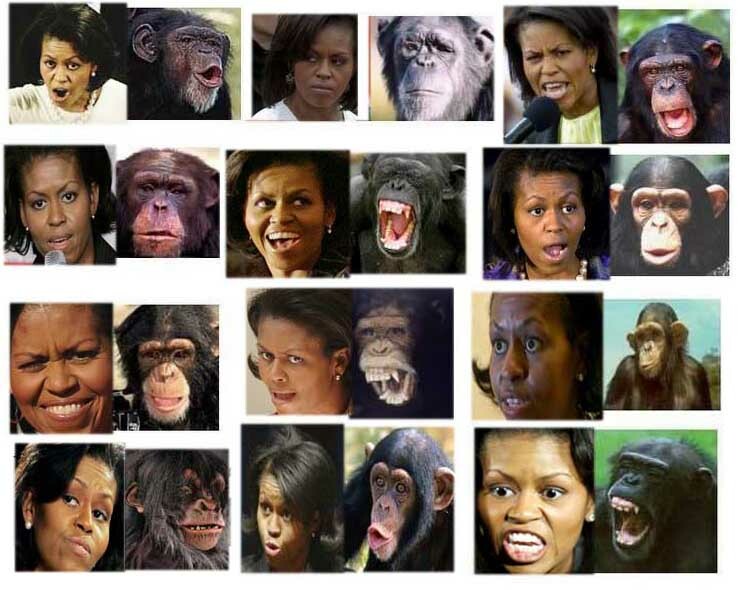 Those that cry “racism” never mention the fact that George W. Bush was compared to a chimp for 8 years. Wow. I’m surprised whoever put this together could see their screen through the white sheet covering up his/her face. Copyright KKK 2010 should be at the bottom of the image. So much for a nation with diverse cultures. The “white thing” is still not dead. Look at the mirror and laugh at the image you see there. You will realise you cannot beat Michelle! And yet she commands an entourage of 100’s that spend $$$$$$ like it’s water. Pretty soon this monkey will have golden teeth. WHAT it’s just BLING. Trouble is, bling don’t make you look so good.